Identification: Wing margins are scalloped. 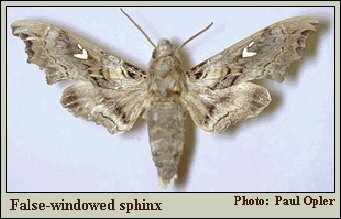 Upperside of wing is brown with dark brown and tan markings; forewing has a V-shaped white spot near the center of the costa. Wing Span: 2 5/8 - 2 3/4 inches (6.6 - 7 cm). Flight: . Throughout the year in the tropics and Florida. Caterpillar Hosts: Possibly an evening primrose (Onagraceae). Adult Food: Nectar from flowers including petunia. Range: The West Indies and central Florida.